HomeENVIRONMENTAre Substantial Equivalence & Safety Studies for GM Soy Fraudulent? Are Substantial Equivalence & Safety Studies for GM Soy Fraudulent? Over 10 years ago the Pacific Ecologist reported that a Japanese research team uncovered serious discrepancies in safety reports submitted by Monsanto to the Japanese Health and Welfare Ministry. The Safety Assessment Application Documents were submitted in order to obtain a safety certificate necessary for the import of genetically modified (GM) soy to Japan. Based on these reports, submitted by JAPAN- MONSANTO, their herbicide-tolerant soybean was approved as food by the Japanese Ministry of Health and Welfare and as animal feed by the Ministry of Agriculture in 1996. The research team reported their findings to Japan’s Agriculture and Fisheries Ministry but received no response. The Japanese team, led by molecular biologist Masaharu Kawata, University of Nagoya, began with 40 people taking notes by hand over a period of 10 days. This was necessary because the documents, kept at the Food Safety Association, were only available for five hours per day three days per week. Photographing and photocopying were not allowed. The application submitted by Monsanto for Roundup Ready (RR) soybeans consisted of 10 volumes, which piled up to 1 meter high, with much of it in English. Dr. Kawata claims that Monsanto deliberately misinterpreted and disregarded data in their quest to prove their RR soybean is “substantially equivalent” to conventionally grown soybeans. “We found a highly intended misinterpretation ignoring obvious data difference between A5403 [conventional] and 40-3-2 [GM] hybrid in the documents.” Analysis of raw soybeans showed no differences, but the toasted soybeans showed a marked difference. After processing at 108℃ for 30 minutes, the concentration of protein and potassium were not changed but the concentration of urease and lectin were significantly higher in the GM soybeans. Urease (an enzyme) and lectin (a protein) are considered harmful, physiologically active substances. Urease enzymes aid in the conversion of urea to ammonia and carbonic acid, which can cause kidney stones and liver problems. Lectin binds to carbohydrates and can cause intestinal problems. These physiologically active substances remained active even after heat treatment in the GM soybean, though those of the conventional soybean were easily denatured and inactivated. Monsanto decided that the GM soybeans were merely insufficiently heated. They returned the sample to Texas A & M and ordered re-toasting at 220℃ for 25 minutes. “However re-toasting further widened the difference in the activity between the two [soybean] strains. … [A] Scientist would usually conclude in such case that there is substantial difference between the two.” But instead Monsanto toasted the GM soybean sample two more times until they got the result they wanted: all proteins were denatured and inactivated. No protein can withstand repeated heat treatment and remain active. With this result, Monsanto concluded that genetically modified and non-modified soybeans are “substantially equivalent” and they finally had the lab tests to “prove” it. Similar slight-of-hand tactics were employed in toxicity tests for insect-resistant Bacillus thuringiensis (Bt) crops, where only the Bt toxin itself was used in the feed and NOT the Bt as expressed in the GM product. This is based on the following faulty logic: a) a potato (or soy) is not toxic; b) if it can be shown that the Bt toxin (or E-coli protein) is non-toxic; then c) the Bt potato (GM soy) is safe. But the genetically engineered Bt potato is neither a regular potato nor is it the Bt toxin, just like salt (sodium chloride) is neither sodium nor chlorine. In fact, Arpad Pusztai published results showing that a GM potato (containing an insecticidal lectin known to be harmless to mammals by itself) does cause harm, for which he lost his funding and thus his job. Why not just use the Bt potato or the GM soy in the animal experiments? Are they deliberately hiding something? And what’s up with the scientists over at the FDA & the EPA who reviewed these data? Monsanto knew that the toasted GM soybean contained extra, unhealthy enzymes and proteins so they subjected the samples to higher heat multiple times until the problem went away and then submitted those test results to prove substantial equivalence. Monsanto did not bother to determine the entire amino acid sequence in the modified soybean but only the first 15 amino acids. They then made the assumption that the remaining amino acids would be the same as the CP4EPSPS sequence in the bacteria. We still don’t know what the actual expression is in the transgenic soybean. Based on their assumption in (2), they then used the CP4EPSPS protein from E-coli in their acute toxicity tests for GM soy. Monsanto knew that the glyphosate residues in forage were higher than allowed so they simply asked the EPA to raise the allowed limit. And the EPA did. Monsanto knew that there are substantial glyphosate residues in the GM soy and that the glyphosate could cause compositional changes in the soy, yet they submitted samples for animal testing that were never sprayed with glyphosate. Their safety studies still showed statistically significant differences yet they reported that the differences were not significant. Monsanto has deliberately manipulated the samples in (1) & (5) and falsified their report in (6). In scientific circles, (1) (5) & (6) would be known as fraud. The methods employed in (2) & (3) are, at best, extremely sloppy. Number 4 just shows how the US government accommodates the biotech industry. Because Monsanto has invoked patent rights on their GM products, it is illegal for anyone to perform tests on GM crops without prior permission. A 2009 Scientific American article states, “agritech companies such as Monsanto, Pioneer and Syngenta … have explicitly forbidden the use of the seeds for any independent research. Under the threat of litigation, scientists cannot test a seed to explore the different conditions under which it thrives or fails. They cannot compare seeds from one company against those from another company. And perhaps most important, they cannot examine whether the genetically modified crops lead to unintended environmental side effects. … as a result of restricted access, no truly independent research can be legally conducted on many critical questions regarding the technology. … when scientists are prevented from examining the raw ingredients in our nation’s food supply or from testing the plant material that covers a large portion of the country’s agricultural land, the restrictions on free inquiry become dangerous.” The industry controls virtually every aspect of genetic engineering. Have all of the toxicology tests for the safety of GM soybeans been conducted in this manner? Has Monsanto provided all of the samples? Have any of them been tested? Is this same procedure used for other GM products? Toxicology studies using Bt toxins alone, instead of Bt corn or potato, or E-coli proteins alone instead of GM soy protein would be like eating hops to determine the effects of beer. Safety studies on RR soybeans using samples subjected to high heat and never sprayed with Roundup would be like removing the percussion cap from a bullet, testing the bullet for safety and declaring all bullets are the same and therefore safe. Just don’t put them in a gun. Is it any wonder that the results of Monsanto’s safety studies differ from so many other published studies? 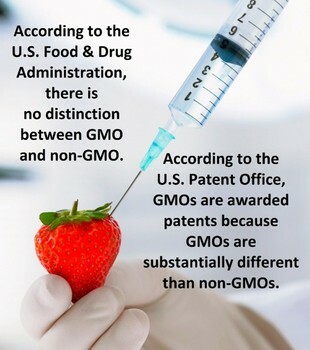 GMOs are perfectly safe. Just don’t eat them. TLB recommends you visit examiner.com for more great/pertinent articles and information.